Grandville Optical is pleased to offer a wide range of optometric services, eye care products including eyeglasses, specialty eyewear, frames, and contact lenses. Our staff is happy to help however we can. Our focus is on you. It shows in everything that we do. From your first contact with us to your appointment and your follow-up, we aim to make your eye care experience great. This is what drives us to provide you with the best care year after year! Dr. Lori Smolinski is a 2000 graduate of the Michigan College of Optometry and attended Adrian College for her undergraduate work. She discovered a passion for the sub-specialty of Low Vision, which strives to maximize the remaining vision of the visually impaired. Upon licensure, she was hired by the Association for the Blind and Visually Impaired in Grand Rapids, and continues to work there on a part-time basis. Dr. Lori is also an Adjunct Clinical Assistant Professor for MCO and serves on several committees for the Michigan Optometric Association. Dr. Lori is thrilled to join the staff at Grandville Optical where her focus will be on contact lenses, computer vision syndrome, and keeping eyes of all ages healthy so they will never need low vision services! Outside of the office, Dr. Lori enjoys travel, arts & culture, and photography. She lives in Holland with her husband Tom, daughter Abby, and 3-legged wonder-dog Booker. John Schlafley is a certified optician, having graduated from Ferris State College in 1977 with a degree in Ophthalmic Dispensing. He then went on to the University of Michigan and did a one year assistanceship in their optical dispensary, contact lens and ocular prosthetics department. As well as working in optical dispensaries, John has worked in wholesale optical laboratories as a supervisor. His knowledge in the optical industry is well rounded and he is capable of problem solving any issues you may have with your glasses. John is also one of the few opticians who can repair metal frames by soldering and has also fabricated a design for a ptosis crutch which is attached to a frame that enables someone with an eyelid muscle problem to keep the eye open. stop in and talk to him. 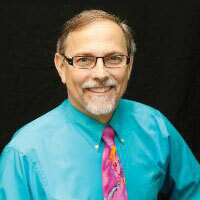 John started Grandville Optical in 1987 with an ophthalmologist. In 1993, John purchased Grandville Optical. In 2002, John hired Dr. Lori and Paulette as part of his staff and in 2004 moved Grandville Optical into its present location which blossomed into a beautiful New York coffee house style optical boutique. John is married to Beth and between them have 3 daughters, each one having a beautiful child. They also have 2 dogs, 2 cats and a bird. John enjoys motorcycling, cooking, sings in the church choir and is active in the Grandville Chamber of Commerce and BNI (a business networking organization). BNI puts him in contact with a lot of area business men and women from lawyers to mechanics, so if you’re looking for someone of a particular category, give him a call, you’ll never know what possibilities exist unless you inquire. 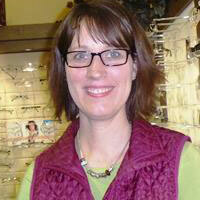 Vicki has been working at Grandville Optical since 2011. She is an ABO Certified optician. Vicki attended Ferris State University for Optometric Technology. She worked in an optical store in Lansing for some time. She moved to Grand Rapids in 1993 and worked as a receptionist at various businesses. She was a stay-at-home mom to her 2 kids for many years before rejoining the workforce in 2011. She resides in Jenison with her husband, 2 kids, 2 bearded dragons & 6 chickens. Her hobbies include quilting, reading, cooking & spending time outdoors. She is also very involved at the kid’s school with volunteering for many activities. As a family, they love to go camping…the more rustic, the better. My husband and I have been coming here for two years. Excellent staff and good value. We feel well-taken care of.